Jovon Johnson, right, gives a pointer to a Mustangs defensive back. Jovon Johnson lives what he preaches when it comes to giving back to the community. The star defensive back for the CFL’s Saskatchewan Roughriders was in Saskatoon on Monday handing out backpacks full of school supplies to students at Princess Alexandra School and King George School. Following those stops, he made a visit to Mount Royal Collegiate to give a talk to the Mustangs junior and senior football teams and led a helping hand for the entire duration of a two-hour practice. The 34-year-old, who was on a “day off,” stressed how key it is for him to be active in the community. Jovon Johnson, right, stresses catching the ball at its highest point. “It is important because of the platform that we have as professional athletes to be involved in the community,” said Johnson, who stands 5-foot-9 and weighs 190 pounds. “The community pays our paycheques. “At the end of the day, it is our job to give back to them in as many ways that we can. We can create ways to be involved in the community, so I brainstorm a lot and come up with ideas and put them in motion. One of Johnson’s brainstorms was the idea of handing out backpacks full of school supplies to children in schools. Jovon Johnson sets to throw the football during a DBs drill. The 12-year CFL veteran and 13-year professional football player reflected on his own upbringing in Erie, Pennsylvania, when he didn’t always have everything he needed. He gained supporting partners in TD Bank, Lipsett Cartage and Staples Business Depot to help put together 500 backpacks with school supplies, which were handed out between schools in Saskatoon and Regina. Johnson contacted a company in the United States to supply the backpacks. Joined by receiver Bruce Thompson, who is on the Roughriders negotiation list, Johnson said he loved seeing the heartfelt expressions on the faces of the children when they received their backpacks. He could tell the gesture meant a lot. Jovon Johnson, right, demonstrates a technique in the backpedal. Besides seeing how appreciative the students were, Johnson was blown away by how much support he received in this endeavour. At Mount Royal’s football practice, Johnson spent his time focusing on helping the Mustangs defensive backs with footwork and technique. He wanted to stress the importance of being fundamentally sound and playing attention to details to the players. Johnson said his fundamentals have helped him play professional football for as long as he has. He was a member of the NFL’s Pittsburgh Steelers in 2006 before joining the CFL ranks in 2007. The winner of the CFL’s most outstanding defensive player award in 2011 enjoyed the chance to share his knowledge with the players on the Mustangs. Jovon Johnson addresses the Mustangs after their practice. “It is good for me, because being that I have been a professional for 13 years now, I know at some point ultimately it is going to come to an end,” said Johnson. “I know that my calling in life after football is probably going to be coaching. The Roughriders (7-4) return to action on Saturday, when they host the Ottawa Redblacks (6-5) at 7:30 p.m. at Mosaic Stadium in Regina. Mark Dinsmore from Wheaton GM skates in on a shootout chance. The SaskTel Centre ice surface became the place for lunchtime shinny fun on Monday during a press conference involving the WHL’s Saskatoon Blades. 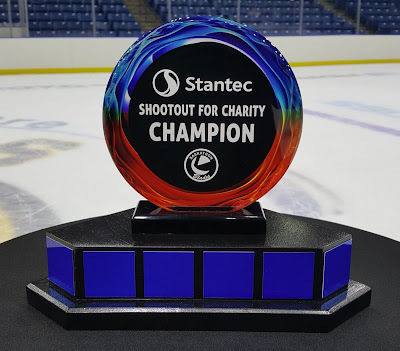 The Blades and Stantec Inc. introduced the Stantec #Shootout4Charity fundraising initiative, which will be a feature at Blades home games. A total of 16 community leaders from 16 different companies each representing a charity of their choice will go head-to-head in a shootout. The head to head shootouts will be held during intermissions of Blades home games, and they will be conducted in a tournament style bracket. The first shootout will be held during the Blades home opener, when they face the Swift Current Broncos on Sept. 22 at 7 p.m. at the SaskTel Centre. The final match and winner will be crowned on Dec. 27, when the Blades host their archrivals the Prince Albert Raiders. The winner will receive $3,000 for their charity, the runner-up will receive $1,500 and the third place finisher will be awarded $500. A shootout demonstration was held in conjunction with the press conference with shooters from all 16 companies taking part in the demo. The Stantec #Shootout4Charity championship trophy. The Stantec #Shootout4Charity will also include a social media contest where contestants will create videos in support of their charities. A total of two prizes worth $500 each will be handed out for the social media video contest portion of this initiative. “Community is a huge pillar in our organization, and while we work towards building a champion on the ice, we feel a responsibility off the ice,” said Blades president Steve Hogle in a release. “We play an incredibly popular sport. The Blades return to action on Thursday, when they host the Regina Pats in a pre-season contest at 7 p.m. at the SaskTel Centre.